Looking at the pictures of the bombed out shell of Aleppo’s buildings or the images of wounded and dead children which have daily filled our screens no-one can fail to be moved. Some may even greet the news of the fall of Aleppo to the forces of the regime and its allies with relief. But the killing and the mayhem will not stop here. Those who live in the West have seen a lot of the horrors of Aleppo because they are being committed by its arch-enemies in Syria, Iran and Russia. A lot less is said about the massacres and humanitarian disaster that the West’s ally Saudi Arabia is inflicting on Yemen. A million people are now in danger of starvation there. After all it is using the bombs, planes and missiles which the USA and UK, amongst others, have supplied in huge quantities to the Saudi Kingdom which are inflicting the casualties. Whilst Western media and politicians wring their hands at the horrors of Aleppo we will see a lot less of the coming massacre in Mosul. Here Iraqi and Kurdish forces backed by Western military advisors have been closing in on the city for the last few months. However progress has been slow so far and even the crack special US-trained troops of the Iraqi Golden Brigade have lost 50% of their manpower. The offensive has stalled so the next tactic will be to “do an Aleppo”. Unrelenting and indiscriminate air strikes similar to those the Assad regime and its Russian friends inflicted on Aleppo will be the order of the day. The difference will be that we will see less of its impact on the 1.5 million inhabitants of Mosul who have spent the last 2 years suffering under IS rule. A strange “liberation” indeed. And the fighting goes on around Damascus. The terms of the deal that Russia and Iran brokered with Turkey specifically exclude those “terrorist groups” like the former Al Nusra Front (now Fateh al Sham) which means that any talk of ceasefire is so much hypocrisy since the fight against them can go on. And as the different militias (some included in the ceasefire, others not) occupy the same areas like the Damascus suburb of Wadi Barada (critically the source of much of the city’s water) it leave the Russians and the regime the opportunity to carry on bombing and attacking. One lie is heaped upon another. Russia said it entered the Syrian theatre to oppose IS but targeted Assad’s other enemies (who were supported by Saudi Arabia, Qatar and the West). Turkey has abandoned its earlier support for IS and now claims to be in Northern Syria to fight against it. In reality it is in Northern Syria to deny the YPG (Syrian Kurdish forces of the PKK franchise) the territory it would occupy if IS retreated. The aim is to try to prevent a Kurdish state entity on Turkey’s borders (and if this fails to ensure that any territory the Kurds control is minimal). However to achieve this, as we have indicated before, Erdogan has had to execute a decisive U-turn. Previously he was determined to see Assad ousted but now accepts that he can remain (although Turkish ministers still kid themselves (or their listeners) that this might be a transitional arrangement). His aims now are to crush the two main threats to his rule in Turkey – the PKK (and the Kurdish movement in general) and IS, both of whom have retaliated with bombings and shootings like that in an Istanbul night club on New Year’s Eve. As the destruction of Aleppo, and its remaining Sunni population, continued in the last three months of 2016 the West indulged only in moral condemnation. Some have seen the fall of Aleppo as a defeat for the US, a sign of its decline. In truth the US was not really concerned whether Assad fell or not. This can only be understood in the context of its previous failures and its current aims. In particular the Bush administration had created the conditions for the growth of IS when they dismantled the Ba’athist state in Iraq. US intervention in Iraq and later Libya was because Saddam Hussein and Muammar Ghaddafi threatened US hegemony at its most sensitive point – the control of the world’s financial system. Both wanted to use other currencies than the dollar to sell oil. Thus they had to go and the US put together coalitions which either invaded directly or imposed a no-fly zone (again behind the hypocrisy of saving lives) in order to deny the regime decisive air power. The final piece of hypocrisy in all this is the UN vote to endorse peace talks in Kazakhstan. This will involve only the Iranian, Turkish, Russian and Syrian regime plus representatives of the opposition (without their imperialist backers in Saudi Arabia and Qatar or the Western powers). The talks will not start for months so the various sides in the conflict will use the time to regroup to prepare for the next major battle which will be for Idlib, the last stronghold of the Free Syrian Army and its many allied militias. Assad will turn up to the talks, make the same denunciations of the opposition as terrorists as he has always done and then they will collapse. 2017 will not be a year of peace. There will be two battlegrounds in Syria and Iraq. Assad and his allies will try to retake as much of the territory as they can and they don’t care whether they inherit totally destroyed towns and cities. In the East the campaign of the Iraqis and Kurds against IS will get the full support of the West until both Mosul and Raqqa have fallen. IS will respond, as it has done everywhere but most recently in (yet again) Baghdad with more suicide bombings against the “Crusaders” and the “traitors” who ally with them as the New Year opens. And behind all the hypocrisy lies the contradictions of global capitalist system in crisis. Despite all the assertions of its impending recovery economic stagnation is making for an intensification of the imperialist appetites of all states. From the South China Sea to the borders of the EU nationalist rhetoric is being stepped up everywhere as compensation for this economic failure. And the greater the economic privation the greater the appeal to nationalism. Everywhere it is the “other” who are to blame for all our economic and social problems. Everywhere there is an increasing sense that this or that national is special. There is a demand is to get behind the “country” and relive supposedly former past glories. Alongside the sanctions and other trade restrictive methods these are dangerous preparations for yet more war. 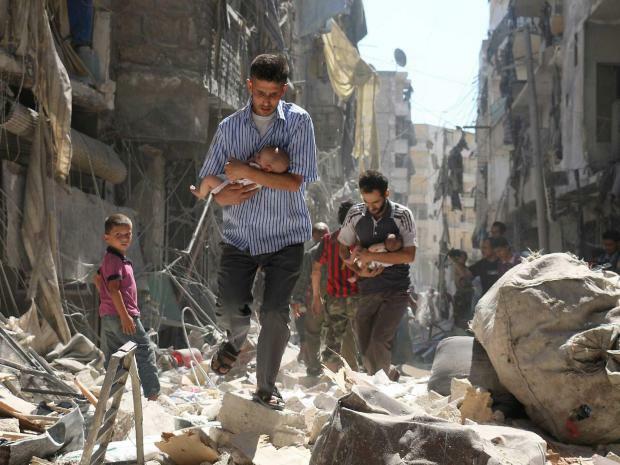 There will be more Aleppos to come as the world lurches down the road to catastrophe. Workers have to be clear that there is no “good” side to support in an imperialist confrontation. All sides are fighting to get the right to exploit us for their own ends. We have no country, as Marx said in the Communist Manifesto, but if we do not resist the drive to war when it becomes even more serious their will be no world left for us to win for a better future society. The only war we should be ready to fight is the class war. Wars start when people in one area (call it nation or homeland or whatever you like) invade one or more other areas. People being invaded and or bombed are hardly likely and cannot be expected to just treat the invasion as due to imperialism and stand by whilst invasion continues. All the main and subsidiary reasons for war can be evaluated as explanations, but don't protect nor save people from being invaded. Marx, largely backed by Engels, with his business background, said that workers had no country, and in terms of capitalist property that was true at the time, but nowadays many people do have thieir 'own' homess, some have their own businesses, and cannot be expected those to become overrun and occupied by people from elsewhere, irrespective of millions of problems caused by capitalist imperialism in lands from which they do or will try to come. Chantiing marxist texts leaves questions to be put and examinations of actual conditions to be made, no matter how fervently comrades would prefer to refer back to doctrine. The voice of the petty bourgeoisie again KLZ. I think you should post on the Daily Mail. It may have escaped your notice but the UK is currently bombing Mosul and has supplied weapons to the Saudi regime which is mercilessly deploying them against the Houthi in Yemen - and no Syrian or Yemeni invasion of the UK has ever taken place (although you will no doubt complain of the Yemenis who came here at a time of labour shortage to work in the steelworks whilst Syrian refugees fleeing from the attacks of others you would just see as stealing the benefits for "British" workers despite the fact that most of them are professional workers). Most workers have a mortgage and those that have paid them off will need to use the income to fund their increasingly privatised elderly care as things are going so we never own property in the sense that Marx understood it. Private (as opposed to personal) property means the control of the means of production which will always be in the hands of the capitalist class until we get our act together and wrest it from them. Don't put words in my mouth ! Don't assume that I am unaware of events ! I am well aware of Marx's view of capitalist property as being that of industry etc rather than of individual homes etc, As for labelling me 'petit bourgeois', and 'thus' should post to the Daily Mail, may I remind you, an opponent of 'anti-fascism', that in the 1930s that paper supported Oswald Mosley, who was campaigning against what he thought would be a 'brothers' war', but his so-called brothers went on to enact the holocaust, aided by pro-nazi Ukrainians, amongst many other war crimes. Now I suppose that you will go on to lecture me on all sorts of war crimes commited by other nations, as part of the overall product of imperialism. But please remember that the majority of nations are not making war on each other, nor intend to, so far as is known at present. Lenin said capitalism is horror without end. In this phase of insoluble crisis tomorrow's world is worse than today's. The only way out is the autonomous class struggle. We who advocate revolution are not going to apologise for our disdain of interclass ''solutions''. We are not going to select good and bad amongst the ruling class. If workers fight, then our task is to say, you have no friends in the capitalist class, turn your struggle into revolution. Alternatively, tomorrow is worse than today.